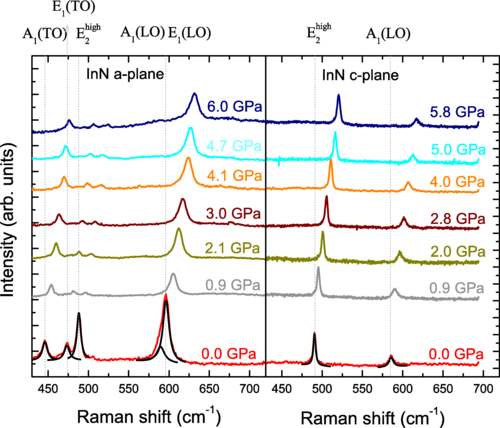 We investigate the hydrostatic pressure dependence of the zone center optical phonons of c-plane and a-plane wurtzite InN epilayers grown on GaN substrates. The longitudinal to transverse mode splitting for the A1 and E1 modes was found to increase with increasing pressure, whereas the associated transverse effective charge decreases for both modes as e∗T(A1)=2.93–9.9×10−3P and e∗T(E1)=2.80–10.6×10−3P (in units of elementary charge and P in GPa). These observations are well in line with results for other II–VI, III–V, and group-IV semiconductor compounds as far as the relation between the magnitude and sign of the pressure derivative of e∗T and the bond ionicity is concerned. As the latter increases so does |∂e∗T/∂P| with a sign change from positive to negative for bond ionicities around fi=0.46 for compounds with anions belonging to the first row of the Periodic Table. A comparison of the results for InN and other nine tetrahedrally bonded compounds indicate that the pressure behavior of the transverse effective charge is mainly determined by the strength of the Pauli repulsion between cation valence electrons and those of the anion core. We also perform ab initiocalculations in order to address the origin of the observed increase in linewidth of the Ehigh2 mode which is found to arise from a pressure-induced increase in the rate of two-phonon decay processes. This broadening is associated with tuning into resonance of a steep edge in the two-phonon density of states around 460 cm−1 with the frequency of the Ehigh2 mode.